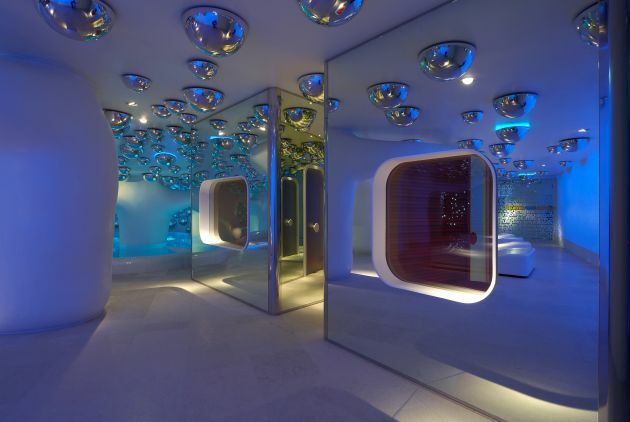 Italian architect Simone Micheli has completed the design of a wellness centre at the Exedra Milan Hotel for Boscolo Hotels in Milan, Italy. 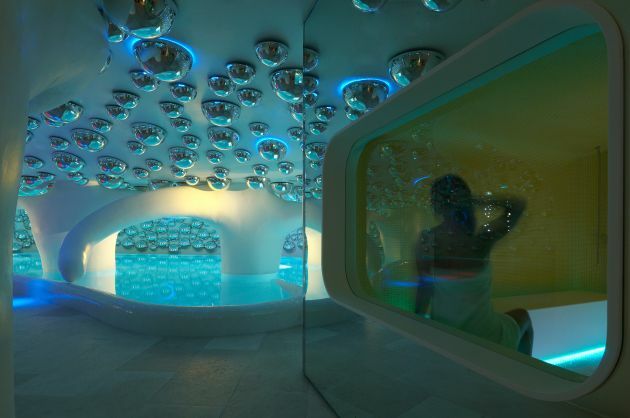 *Note* – Regular contemporist readers might remember that in October we featured the wellness centre that Simone Micheli designed for the Exedra Hotel in Nice, France. You can see it – here. 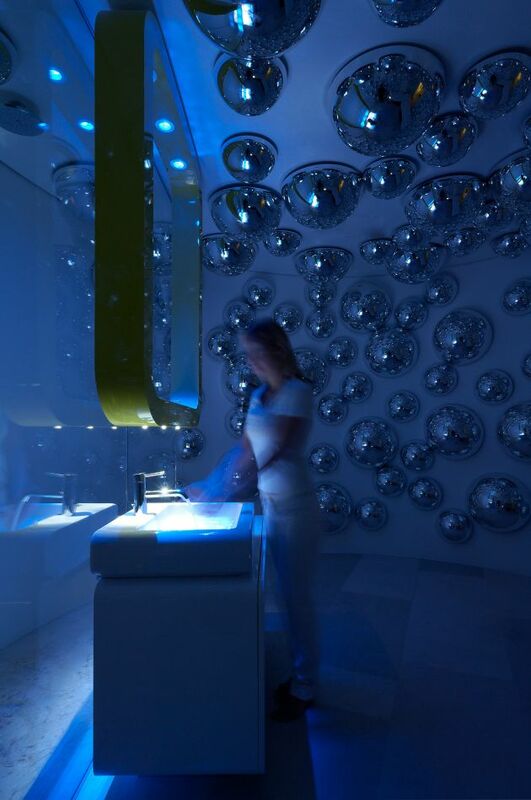 This work triggers a sense of heady emotional dizziness in the visitor, it is destined to become a milestone as for future international wellness centers. This is the result of architecture inside the architecture which enables the users to enter a unique 3D multisensorial dimension. This is a 3D manifesto resulting from a possible and conscious union among architecture, sensoriality, wellness, from the synergy among highly effective basic furniture, plasitc and fluid shapes and the personal experience of the guest walking in this place surrounded by a dreamlike scenario.This is an interactive, hybrid, breathtaking and iconoclastic place where all features are distinctive as witnessed by the reception area, passages, men’s and women’s changing rooms, treatment cabins, “humid” area with sauna, turkish bath, showers,ice maker, relax area and by the large swimming pool sporting multiple water effects and hydromassage jets. All the above mentioned features aim at accompanying the visitor on this dreamlike trip by lulling and involving him.This space posseses its personal identity indipendently of the hotel. 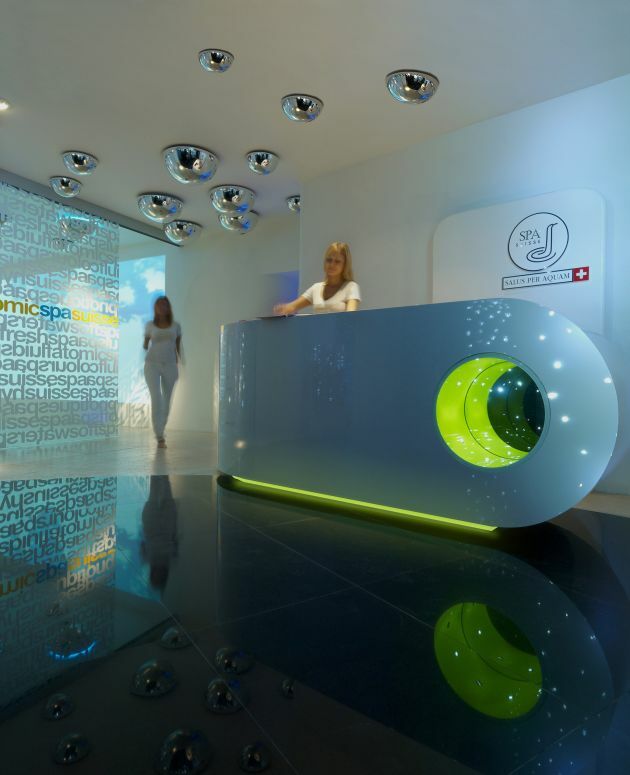 The reception desk which is perfectly white and shiny gives us a warm welcome thanks to the multicoulour backlighting and round shapes, it introduces us to the future world, the new enchanted world we are approaching by chasing a dreamlike and visionary Alice in Wonderland. A round porthole which represents an eye on the future whispers us to get ready for a new experience , to raise our emotional antennas and prepare ourselves to perceive new and unpredictable sensations. From the full lenght window which separates this area from the relax area we can glimpse through the screen printings a breathtaking display of lights and reflects, an outstanding array of plastic surfaces which strikes our senses and make them vibrating in awe. In the same way as an expert film director can convert experience into memory by increasing wait and desire following an ascending climax by means of a narrative rhythm pattern,Architect Simone Micheli diverts our attention from the sight of the incomplete central space in order to draw our attention along a long and narrow passage, a sort of emotional ascent towards the edge of sensory experience. 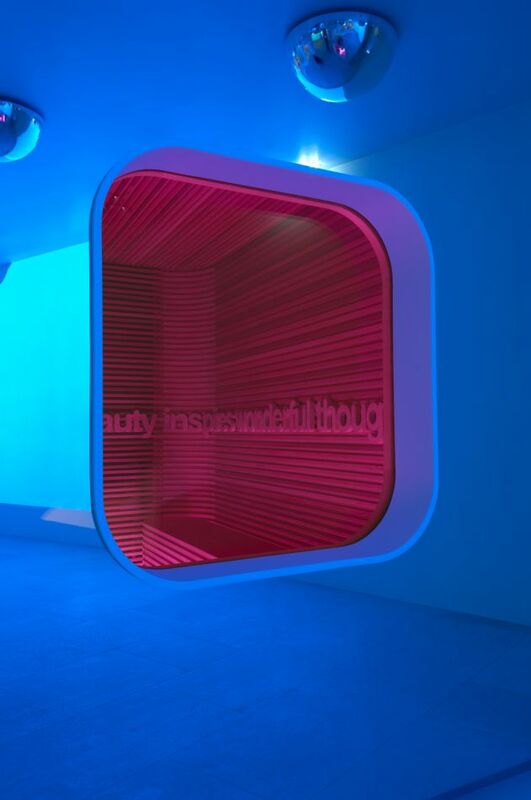 This amazing trip is accompanied by luminous floating windows where products are exhibited on one side,while on the other side the acidated glass entrance doors of the treatment cabins are located. 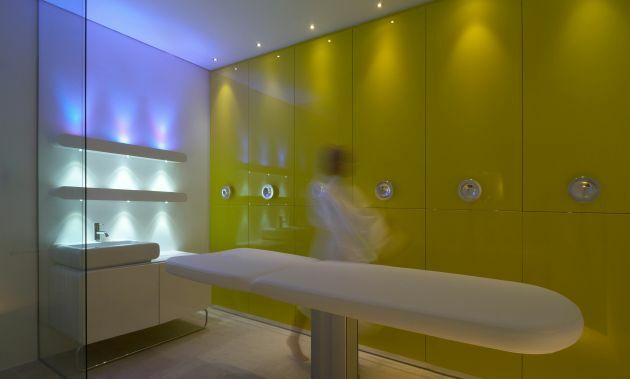 Treatment cabins sport simple, soft and rigorous furniture which benefits from the lighting and colour effects resulting from a targeted and thorough white and multicolour LED lighting. This environment is highly inspiring and relaxing , the Prun stone flooring,the sink cabinet and the white shiny shelves feature sober and elegant tones. The taps, graphics on the entrance doors, the door handles and the doors of the large wall closet coming in acid green in order to shed new light on the environment by making it more playful, share the same accurate finish forming a unique complete independent body. This results in creating a macroenvironment surrounded by unique, distinctive microevents which play a crucial role in the whole creation process. At the end of the passage just past the changing rooms soon after a few stairs featuring blue LEDs we enter into the heart of the wellness center. 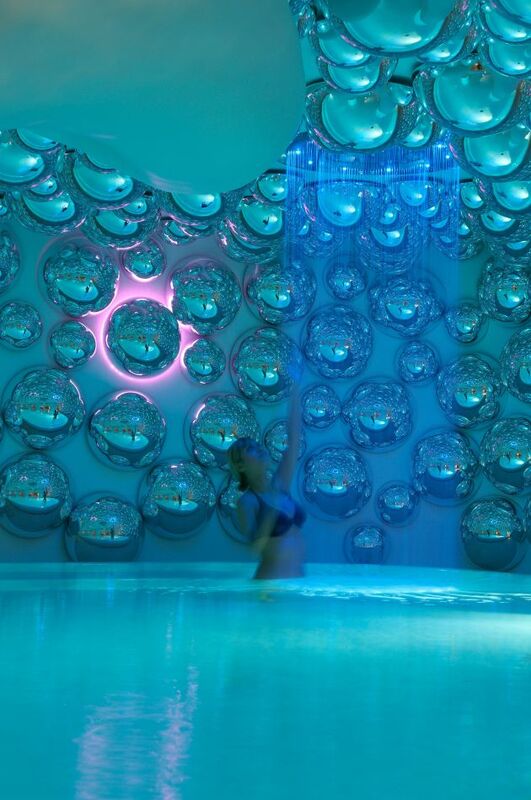 The mirror bubbles, the macroscopic plastic chromium plated “melted metal” drops hang from the ceiling and shine. As soon as these rarefied drops fulfilled their task of accompanying the visitor in the same way as champagne bubbles going up the neck of the bottle, they thicken, they increase in number. 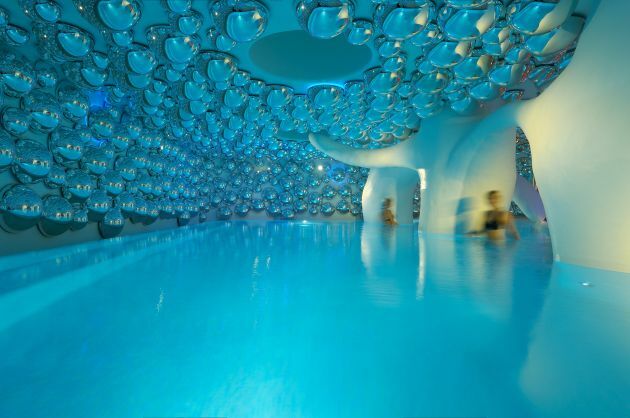 As we approach the large swimming pool which metaphorically represents the origin of the lively explosion they converge into a sudden burst of sparkling bubbles. The big sinuous trees having long swaying arms which seem to float in the air searching for a melting embrace form a Pantagruelian Ring a Ring o’ Roses of phytomorphic souls by means of evocative reflects of the drops on the ceiling. 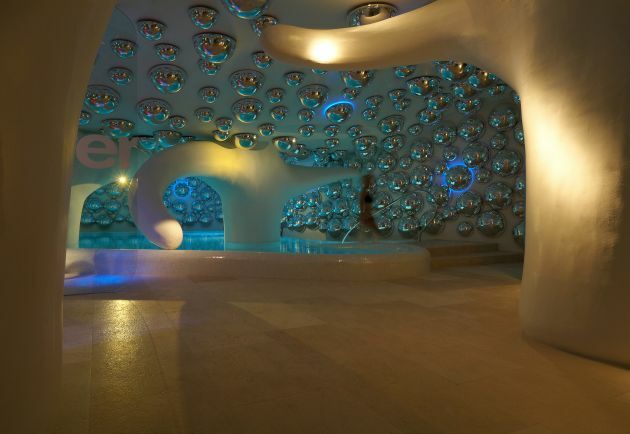 All this creates a kaleidoscopic dreamlike scenery enabling the visitor to enjoy a deep, unique sensory experience. 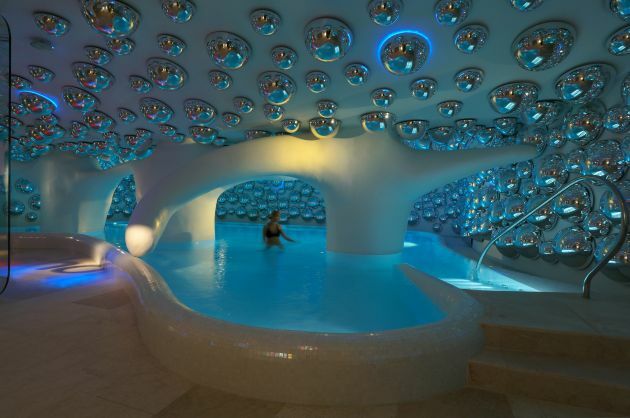 Two circular skylights resembling two big eyes are located in the roofing and they push their way through thousand bubbles in order to illuminate almost in a sacred way the swimming pool surface barely rippled by the water effects and by the hydromassage bench. 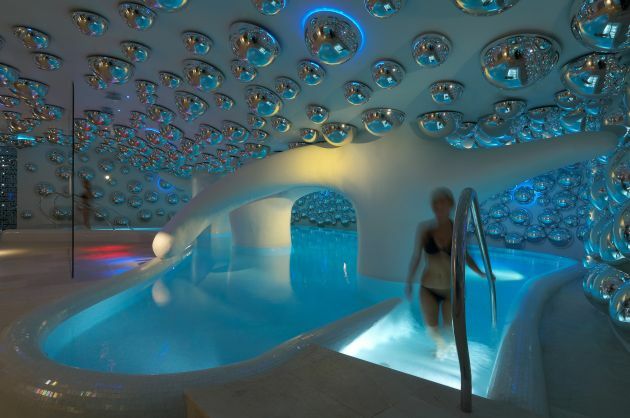 A big shower head enriched with blue LEDS highlights and tree-columns that weave their branches and lean towards the light complete the swimming pool space array. 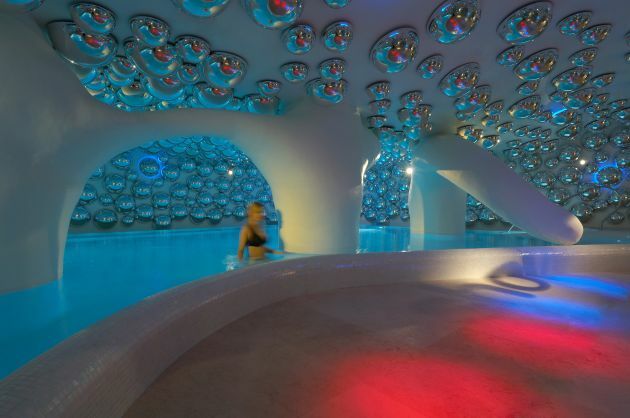 This space is suspended and its naiveity emerges from the walls semishiny resinifications, the large expanded polypropylene animated columns and the white pearl mosaic lining in the swimming pool. A ten meter macroprojection which covers a whole wall creates a constantly changeable virtual landscape. Six soft sinuous soft monolithic filled couches are located on the Prun stone floor of the Relax area ,five are single couches and one is a double couch. All couches are made up of white ecoleather and designed by Architect Simone Micheli. 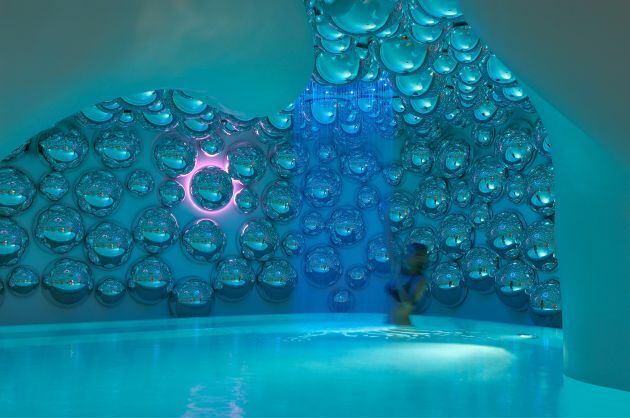 Four sensory showers are located in the area detached from the relax area which reaches the interior part of the swimming pool. Two showers are warm and two are cold, they are shielded by a full lengh belevel window, the former are marked by red LEDS while the latter are marked by blue LEDS. The ice maker is located in a cavity of one of the big central trees,it features a big circular hole in the external column surface which can be an effective light source as well. The sauna and turkish bath rooms are entirely mirror lined in order to the set the perfect background for the central core of this amazing place by reflecting its content, pushing back boundaries and increasing its evocative power. The two windows which seem to float in mid air represent the only way to see the interior of the two rooms. The all cedar lathe lined sauna sports a long bench, three cylindrical seats,essential convenient and evocative furniture as the statement with cedar letters on the clear walls. 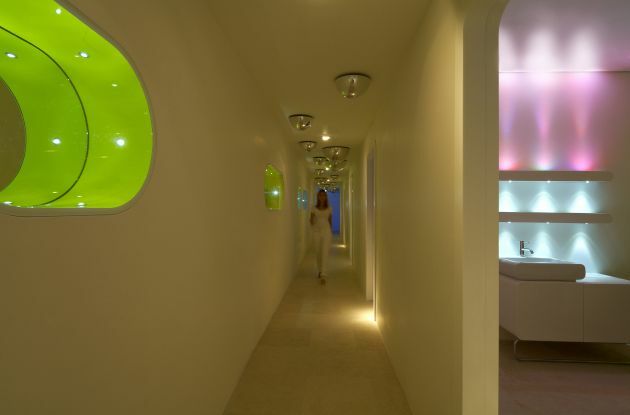 On the other hand the turkish bath boasts a all white pearl mosaic lining. 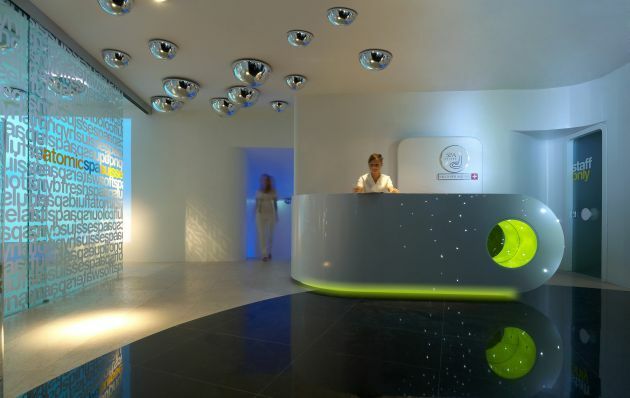 The seats are made up of white solid surface and they are illuminated from below by multicolour lights. 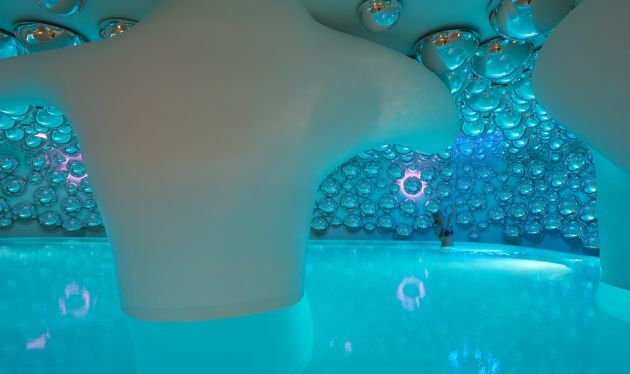 A special sensory cabin is located near the relax area and the swimming pool. This sensory cabin represents an authentic independent and self–reliant core, it appears circular in the plan. 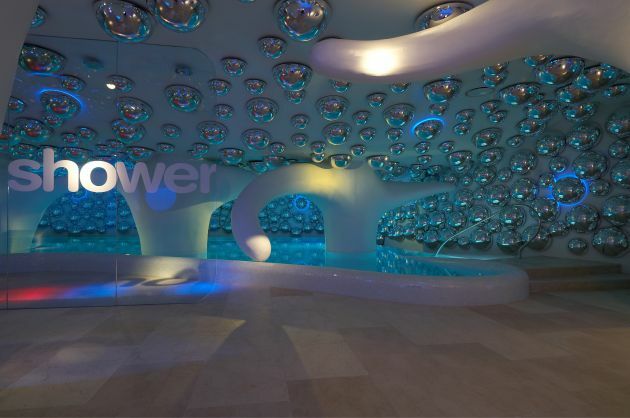 It is entirely covered with reflecting melted metal drops and sports two treatments couches in addition to a gigantic frame capable of focusing on those who stay behind the glass and of providing new ways of perception thanks to multicolour light installed all over the area. 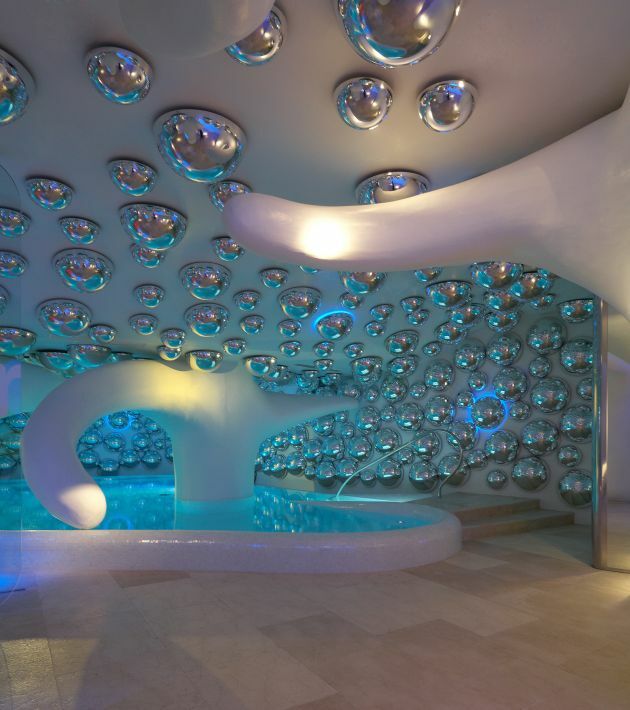 This wellness center is the result of a thorough search in composition and creative techniques focused on a personal, intimistic and hypercomtemporary synthesis. It has its foundations in Van de Velde studies, in particular his obsessive care in defining architectural space and in Gropius Total Architecture aiming at finding a coordination capable of integrating art with trade, artistic creation with industrial production. Visit Simone Micheli’s website – here.